One of the biggest threats the USA faces today is a serious shortage of energy. Vulnerabilities in our system have been made glaringly obvious several times; since the 1970's the USA has had social and economic upheaval due to the actions of foreign oil producers, and two hurricanes in 2005 showed just how fragile our remaining domestic supplies of oil and natural gas are. The fact that the nation has a Strategic Petroleum Reserve shows that this is a matter of national security. For such a serious matter, it's being treated in a very casual fashion. There is no national program to manage oil demand in the event of a supply crisis, or employ market forces to help. Neither is there a long-term initiative to reduce oil dependence and the size of the threat. While the US looks to become dependent upon imported natural gas in addition to oil, there's nothing in the works for a Strategic Natural Gas Reserve. And as for a national building code or even minimum standards for building codes, there's nothing worth mentioning. A self-sustaining system which replaces petroleum-based fuels in the short term, and all fossil fuels eventually. 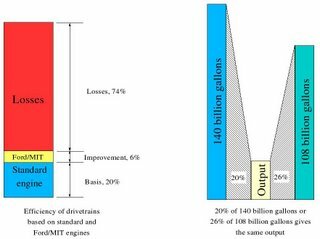 Productivity high enough to eliminate the displaced fuels without major land-use or other changes. A shift toward a neutral carbon and GHG balance, or even a negative net balance. You can look through our initiatives from last year's energy bill through the previous three administrations, and you wouldn't find anything like this. Nothing in our current energy "policy" even aims squarely at these goals, let alone has a prospect of meeting them (though Carter and Clinton/Gore do deserve credit for thinking about it). 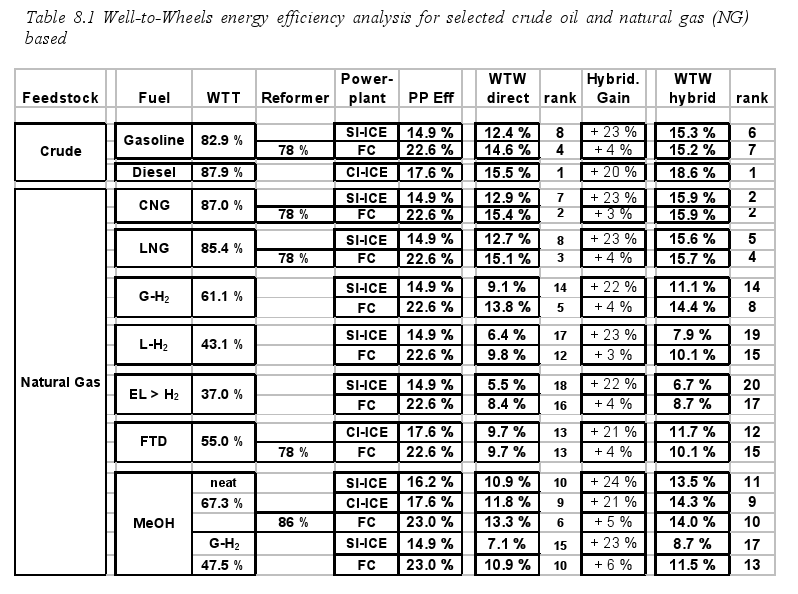 Replace all the petroleum used by the ground-transport sector (55% or more)? Replace all the natural gas used by the electric-generation sector (about 1/3 of US natural gas consumption)? Replace every pound of coal burned for electricity (about 90% of all US coal consumption)? Eliminate over 1.2 billion tons of carbon emissions (4.4 billion tons of CO2) from oil and coal. All that, and have some left over. I believe we could, and I'll illustrate how (with numbers!) below. But to understand where we need to go, we should first see where we are and how we got here. But what if we fixed that? Corn-belt farmers, who have a market too big to saturate. Agribusinesses like ADM, which reap billions in taxpayer subsidies in the name of (illusory) energy independence. Manufacturers and sellers of seed, fertilizer and pesticides. The politicians whose taxpayer-financed largesse created this bonanza, and who are in turn supported by its beneficiaries (the benefits aren't for the taxpayer). The displaced gasoline comes mostly from some other fossil fuel, the greenhouse benefit is minuscule, and the public pays more overall for the ethanol than they would for imported oil to fill their tanks. In the long run, this is bound to collapse. But in the short run, the program thrives and grows because of the interlocking political support. Perverse incentives can do that. But what if we paid people to do the right thing, instead of the wrong thing? There are further benefits. Distillation is a very energy-intensive step in the production of ethanol for gasohol or E85; blending with gasoline requires anhydrous ethanol, which requires considerable processing beyond making moonshine. But if you don't blend the ethanol with petroleum, the ethanol does not have to be anhydrous; this saves energy in distillation and improves the energy balance of ethanol production. On top of this, a little water in the mix improves the octane-boosting effect. The EERE report Billion-Ton Vision adds various sources of unused biomass and comes up with a possibility of 1.3 billion tons per year. At 15.8 million BTU/ton, this is about 20.5 quads of energy. But just replacing gasoline with cellulosic ethanol requires 26.2 quads of biomass energy; that would take almost 1.7 billion tons! But that's not the end of the story. Gasoline only accounts for about 44% of petroleum products delivered in the USA. Diesel accounts for about 2.8 million barrels/day (at considerably greater energy per gallon), so a full replacement of motor fuel with bio-fuels would take about 2.5 billion tons. That's a lot, but it doesn't look extremely difficult. However, it doesn't include jet fuel, industrial fuel and so forth. I won't calculate biomass-equivalents for these. But that's not the end of the story. Full renewability requires replacing more than just oil. Replacing the fossil energy we get from coal (22.8 quads) would require another 1.4 billion tons plus conversion losses, and natural gas (22.6 quads) would take about the same; those are going to need replacement sooner (global warming) or later (resource exhaustion) too. This all adds up to roughly 5.3 billion tons per year, year in and year out. At a reasonable figure of ten tons per acre for dedicated biofuel crops, this would take about four hundred million acres over and above what's producing the 1.3 billion tons of waste. In 2003, only about 380 million acres were planted to crops in the entire USA! It's pretty clear that this isn't going to happen. Even if we did it, the supply would be stretched to the limit from day one. Energy security demands more than this. We need a supply of energy which averages considerably more than what we consume, so that temporary downturns don't create crises. (Remember how gasoline got very expensive or even ran out post-Katrina, when the Gulf wells and refineries were shut down? Remember how expensive natural gas was that fall? That's what happens when supply is too close to demand. Now imagine an all-biofuel future in a prolonged drought, and add some fires.) Oil supplies are stretched way too tight; replacing one scarce fuel with another is great for producers (like the ethanol lobby) but it just makes the consumer slave to a different master. The old-school methods aren't going to work this time. Pols say what they want, but Nature can't be spun; when the laws of physics say otherwise no vote or PR campaign can trump them. We're going to have to find that energy somewhere else, which means getting creative. There is sufficient biomass energy to replace motor fuel and then some... if the energy is not wasted. Using bio-ethanol in piston engines means taking between 4/5 and 9/10 of the captured energy and throwing it away. Even burning biomass as a replacement for e.g. coal in conventional powerplants means 60% losses or more. It looks impossible to grow enough biomass to take that path. The old paradigm won't work any more. A new systems approach is required. The essence of a successful system will be fewer conversions and minimizing losses. 17 quads of gasoline into 3-odd quads of useful work. 6 quads of diesel fuel into perhaps 2.4 quads of useful work. 6.7 quads of natural gas into 2.57 quads of electricity. 21 quads of coal into 6.88 quads of electricity. The useful work we get out of all of these things comes to roughly 15 quads, far less than the 20-odd quads of biofuels we could get; the problem is getting enough of it in useful form. The key to a renewable economy is efficiency, and efficiency is one thing we aren't pushing hard enough. We could certainly do better. But none of this will change as long as people benefit more from the status quo. Before digging too much into what we should do, let's look at what we're doing now, and why. The incentive structure around our "biofuels" is designed to profit interest groups, rather than to reduce fossil-fuel use or fix global warming. The farmers of the USA grew more corn than we could use, so the price collapsed. Washington's solution: pay to turn corn into motor fuel, no matter how inefficient it is. We can't afford that inefficiency any more, so it's obviously got to change. But unless a sea change in the body politic overwhelms the current system, this requires breaking the current interests apart: some fraction of the people (or at least the voters) who are benefitting now need to see more advantage for themselves in upsetting the apple cart. The big agribusiness and ethanol interests (e.g. ADM) aren't in this group and will have to be dragged along or forced out. Fortunately, some segments don't need to make great changes. The farmers are doing at least part of what needs doing: pulling carbon out of the air and fixing it in a form which contains energy. Is it possible to get them to buy into "more of the same, only different"? And what would that look like? Every Ergosphere reader knows I've got a thing for turning waste into gold. Using corn stover to feed a fertilizer plant (and make all the nitrogen the corn needs, plus more) is the sort of solution I like. Farm income income depends a lot on subsidies, but we're paying for things that don't do us much (if any) good. It's time to stop wasting that money and get something useful for it. So what can farmers make that they ought to get paid for? A dearth of storable, renewable energy. #1 is the big global-warming issue. Farmers can help solve it, but they didn't make it; the problem was created by others. Since CO2 reduction is a public good, it looks like the ideal farm price-support program for the next half-century: we can tax greenhouse-gas creators to pay farmers to offset the damage, and pay farmers some extra to return the atmosphere to a stable state. Just pulling the atmospheric CO2 level from today's 379 ppm down to 350 ppm (a level which would probably stabilize Greenland and Antarctica) requires the net capture of about 230 billion tons2 of carbon dioxide. If we can get 1.72 billion dry tons of biomass per year (720 million tons of waste and another billion dry tons of biomass crops), about 770 million tons would be carbon3; even if we took it all, released nothing back to the atmosphere, and added twice again as much effort from the rest of the world, we'd still be at the job for around a century. Paying farmers to take carbon out of the air and put it in the ground, out of reach (e.g. as charcoal mixed with earth) could be the ultimate price backstop for anything they grew. The risk of price collapses due to bumper harvests would be a thing of the past; sequestration would be the ultimate backup "market" able to absorb anything beyond marketable quantities. #2 favors products which can be stockpiled. Light gases such as methane can be stored in underground formations, but liquids can be stored in tanks most anywhere and many solids can just be heaped. And to solve the greenhouse problem, the fuels must be able to deliver sufficient energy to the user to replace what we'd otherwise require from fossil fuels. Ideally, much of the carbon leaving the system should be produced in a form which can be stored indefinitely. Charcoal certainly meets that requirement (it is used to carbon-date campfires up to 10,000 years old, and perhaps older). Every system has its limits, which must be respected scrupulously; failure to take them into account means the system will fail to meet its expectations, sometimes in spectacular fashion. The limiting factor in most biofuel systems is carbon capture by plants. Once the carbon is captured there are ways to recycle it (some of them with very impressive possibilities), but most of them (like Greenfuel) won't just run on air; they require a concentrated stream of CO2. If the system is to be run on renewable inputs, something else has to do the gruntwork of pulling the carbon out of the atmosphere. Isn't that a healthy part of what farming does? And it could be quite profitable. If carbon removal is compensated at $85/ton social cost, farmers would do very well by it. The EERE report which came up with the 1.3 billion ton figure measures potential waste biomass in the USA. Current production is much smaller. A great deal of that 1.3 billion tons assumes greater production of non-crop biomass from grain and bean crops, which may not happen. Accordingly, I'm only going to assume about 348 million tons of crop byproducts. Okay, what do you do with it? Suppose for a minute that we've got that 1.7 billion tons every year. We've got MSW authorities pulling out all their "green waste", unrecyclable paper and everything else, foresters capturing chips, bark and sawdust, and farmers baling all their extra crop wastes and growing switchgrass or Miscanthus on their marginal land and buffer strips. Where do you go from there? Hot medium-BTU fuel gas (the content of heavy molecules such as tars depends on the operating conditions; hotter operation breaks down heavier molecules). Charcoal, amounting to as much as 30% of the dry weight of the input biomass. A 30% (ashless) yield of carbon would contain about 50% of the energy of the original biomass. The remaining 50% would come off as heat and chemical energy in the gas. The simplest processes for making charcoal do it by burning some of the input fuel, but this can be improved. If the carbonization process was driven partly by external or recycled heat, less energy would be expended in combustion; the net energy yield in the gas would shift away from heat toward chemical energy (and total energy yield of charcoal+gas could exceed 100% of the heat of combustion of the biomass). Medium-BTU gas isn't easily transported, but it can be used at the site of production to good effect. 1.72 billion tons per year of biomass is carbonized. This biomass has 15.8 million BTU/dry ton of energy (27.1 quads total energy). 53.5% of the energy is yielded as charcoal (30% by weight). 88% of the remainder is yielded as chemical energy in hot gas (11.1 quads gas + 1.51 quads reaction heat + recycled heat). The gas can be converted to electricity at 50% efficiency. The electric yield from the processing of the gas would be 5.55 quads, or 1620 billion kilowatt-hours. This is more than twice the US electric generation from natural gas (~750 billion kWh), and more than 1/2 of the total US electric generation from all fossil fuels. In short, all non-renewable natural gas generation could be replaced by energy from the carbonization stage, and a large chunk of the coal-fired generation as well. But that's not the end of it! The process also produces charcoal; at 30% yield, 1.72 billion tons of input would leave about 515 million tons of output. Charcoal can be used for fuel, as a soil amendment or as a feedstock for further processing. Gasified charcoal would produce fewer pollutants than gasified coal and could be used for power generation or production of nitrogen fertilizer. But the most efficient option appears to be use in direct-carbon fuel cells (DCFC's). Up to 80% of the chemical energy of the charcoal can be turned into electricity in DCFC's (and the byproduct heat is still useful). Charcoal is like coal, only more stable. Charcoal is the product of a high-temperature process, and is missing most of the hydrogen and volatile chemicals of coal. It can be heaped and stored for weeks to thousands of years; charcoal from ancient forest and camp fires allows prehistoric events to be dated. It is a valuable addition to soil, creating the fertile "terra preta"4 of the notoriously nutrient-poor Amazon rainforest. It's perhaps the ultimate answer to irregular supplies of renewable energy. An annual supply of 515 million short tons of charcoal fed to DCFC's would produce roughly 3400 billion kilowatt-hours of energy. This is more than the total US generation from fossil fuels, and about 84% of the total electric energy consumed in the USA in 2005; together with the generation from the gas, it could conceivably replace every kilowatt-hour we now use, from the trivial amounts made by solar to the entire contribution of coal, with about 25% extra to play with. It wouldn't be wise to replace everything with biomass energy, of course; throwing away diversity of supply means reducing security. But it shows just how much potential we've got, if we only start using it. So how does this relate to oil again? I've spent the last several hundred words talking about the production of electricity, not petroleum or other liquid fuels. At the moment, electricity has almost nothing to do with petroleum; only about 3% of electricity is generated from oil (and that's including petroleum coke, a coal-like byproduct of oil refining). Our transportation system is the opposite: it currently runs on liquid petroleum fuels almost exclusively, and most vehicles can't accept anything else. These two parts of the energy economy are almost completely disconnected from each other. Getting that electricity aboard the vehicle. If we use the scheme illustrated above, making enough electricity is a fait accompli. Each year the USA burns about 17 quads of gasoline in vehicles averaging perhaps 20% efficient5, and another 6 quads of diesel in vehicles averaging perhaps 40% efficient6; the total useful energy delivered to wheels is about 5.8 quads, or 1700 billion kilowatt-hours7. (The average power is only about 194 GW, a small fraction of the US grid's nameplate generating capacity of over 1000 GW; the current grid could move that much energy during off-peak hours without straining.) Once we've got this energy, the only problem is getting it to vehicles in useful amounts. One possibility is to put DCFC's in vehicles and run them directly on charcoal. If it works, it would be mighty convenient; however, it may be too much of a stretch. DCFC's are based on molten-carbonate chemistry and might be too fragile, hot or difficult to cold-start to make them suitable for the job; they are being investigated for powering ships, but cars and even heavy trucks may be too small. (Carbon storage is also an issue, if it's going to be sequestered.) If the fuel cell can't go on the vehicle, electricity has to be generated elsewhere and stored on the vehicle. The problem is that 60 miles isn't enough by itself, and a PHEV like the Prius+ will still need liquid fuel for extended range; heavy vehicles will probably need diesel or the like for a large fraction of their operation. Plug-in operation cuts the fuel requirement down a lot, but 20% of 140 billion gallons of gasoline plus maybe 50% of 27 billion gallons of diesel is still about 40 billion gallons a year of hydrocarbons or about 65 billion gallons of ethanol. All together, it comes to about 1150 billion kWh of electricity (assuming no efficiency improvements) plus 5.1 quads worth of liquid fuel. The difficulty with liquid fuels is that all the best prospects contain carbon, and using liquid fuels in vehicles dumps the carbon back into the atmosphere. If we go for carbon-neutrality, it means that we can't emit any more carbon than we capture (about 1 billion tons/year in this scenario). Most concepts would go back to the biomass at this point and say "Okay, divvy it up; we use THIS part for electricity and make liquid fuel out of the rest!" 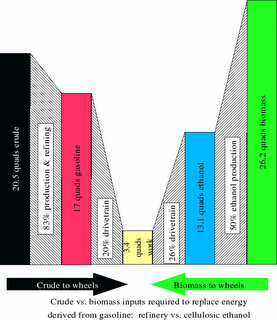 But if you go back to the third graph, it takes huge amounts of biomass to get just a little energy to wheels. 5.1 quads of ethanol from cellulose needs something over 10 quads of biomass. This seriously cuts into the electric output and the charcoal available for fuel (or just to keep carbon out of the atmosphere). It takes a lot of work to grab that carbon. Ideally, we'd hold onto it and use it over and over. It may be asking too much to capture carbon and use it in a closed cycle indefinitely, but twice-through doesn't seem far-fetched. A system which captures a billion tons of carbon a year and turns 30% of it into gas at or near the point of production (biomass is too bulky and expensive to transport very far) is going to have 300 million tons of carbon to play with, as 1.1 billion tons of carbon dioxide. This will probably be mixed with nitrogen, water vapor and some oxygen. This happens to be exactly what some folks want to use as feedstock to make liquid fuels (ethanol and biodiesel). Their current proposal is to use the stack gas from coal-fired powerplants, but cleaner and greener inputs would almost certainly work just as well. Greenfuel claims to be able to capture 30-40% of the carbon passing through its algal bioreactor system. That capture figure seems rather low, because algae grow very quickly on very dilute CO2 from the atmosphere; algae should be able to reduce CO2 concentrations to well below 1%, which would mean 90+% capture. I speculate that Greenfuel's figures are based on the CO2 source running 24 hours a day, whether there is light for the algae to capture carbon for its growth or not; the un-captured carbon would go through to the atmosphere. But that assumes that neither the CO2 source nor the algae-growing system have any way of storing carbon until the algae can use it. If the system is engineered to capture carbon, this is probably a bad assumption. Accordingly, I'm going to make one optimistic assumption here: no less than 60% of the CO2 output of the above fuel-cell system can be captured as algae-derived biofuel. Heat the biomass in the absence of oxygen to convert it into charcoal (515 million tons of carbon, 14.5 quads energy) and gas (~257 million tons of carbon as CO and CO2, traces of methane, etc. plus hydrogen and water, ~11.1 quads of chemical energy + process heat). Send the fuel-cell exhaust gas, full of CO2, to an algal photosynthesis process. 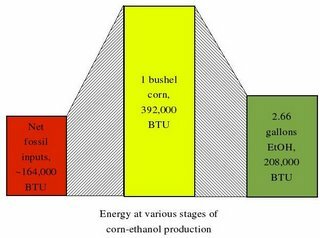 Capturing 30% of the carbon as carbohydrate would process 83 million tons/year; if it came out as ethanol, it would amount to 44.9 billion gallons (about 3.5 quads out of the 5.1 required). If another 30% could be captured as vegetable oil, it would be another 20 billion gallons or so; that would make about 3.1 quads of energy as liquid fuel. That totals 6.6 quads, enough to cope with some losses. The ethanol is distilled with the waste heat from step 2. The vegetable oil is converted to glycerine and ethyl esters (biodiesel) with some of the ethanol from step 4. Excess glycerine from step 5 is gasified and fed to the fuel cells in step 2 (energy recycled). The charcoal goes to burial (sequestration) or electric generation. The CO2 from electric generation is either sequestered (deep-well injection, enhanced oil recovery) or used as more feedstock for algal fuel; 1/3 of the carbon from charcoal recycled to step 3 would roughly double the liquid fuel yield. The issues at hand are liquid-fuel demand, electric demand and carbon sequestration. Let's take them in order. It's claimed that plug-in hybrid vehicles with as little as 60 miles of electric range can reduce motor fuel needs by as much as 80%. If that is the case, the demand for gasoline could be cut from 140 billion gallons of gasoline equivalent (GGE) to about 28 billion. Providing the same amount of energy from ethanol would require about 42 billion gallons/year, which could be provided by step 3 above. Displacing half our diesel fuel could be accomplished with the capture of another 30% of the off-gassed carbon. If the total carbon capture could be improved beyond 60%, it would supply other needs as well. Transferring energy demand from gasoline to electricity might add as much as 800 billion kilowatt-hours per year to grid consumption. The US also uses about 43 billion gallons/year of diesel, supplying perhaps 1400 billion kWh of work to the wheels of vehicles from medium trucks to freight trains; supplying half of that via the grid would add another 700 billion kWH/year of load. The sum of these two is roughly equal to the estimate of the electric yield from the carbonization process. If half of the energy was supplied from electricity and the other half from biodiesel, it would take about 22 billion gallons of biodiesel. The biodiesel fraction could be largely supplied by step 3 above; a slight improvement in either biodiesel production or truck efficiency would make up the difference. The USA uses about 4000 billion kWh of electricity per year. Roughly half of this comes from coal, and another 19% each from natural gas and nuclear; the remainder comes from petroleum and renewables, with the bulk of the last being from hydropower. The total electric generation from fossil fuels in 2005 was 2900 billion kilowatt-hours. This entire quantity could be supplied from the 515 million tons of charcoal; the possible 3400+ billion kWh could more than replace the combined fossil-fired electric production by itself. That would make both US ground transport and US electric generation approximately carbon-neutral without further measures. The final issue is carbon sequestration. Any charcoal not used for fuel could be buried. Charcoal used in DCFC's would produce nearly-pure CO2, which allows fairly easy and cheap capture. If not recycled through algae to make liquid fuel (over and above the quantities calculated above), it could be compressed to liquid and injected into old oil and gas fields or deep aquifers. It appears feasible to remove most or all of the 515 million tons of carbon from the atmosphere permanently, or nearly so. The final question: Could we produce 1.7 billion tons/year of biomass? We're already making half that or more in waste, in forms ranging from corn stalks to grain straw to sawdust to grass clippings to waste paper. If we could get as little as 10 tons/acre from crops like switchgrass or Miscanthus, another 100 million acres would do the trick. These would be perennial crops, requiring little intervention beyond mowing and replacement of harvested nutrients. But we've been neglecting one essential party to this effort. It's time to return to him. What does this do for the farmer? Suppose that we pay $85/ton for carbon removed from the atmosphere (about $27/ton of CO2). An acre of corn yielding 150 bushels at $3/bu would pay $450 for the grain; the 2.5 tons dry weight of excess stover from that same acre would contain another 1.1 or so tons of carbon, for $93 in abatement fees. But a farmer might be a member of a co-op producing electricity, charcoal and ethanol from crop waste. 2.5 dry tons of stover would provide roughly 39.5 mmBTU of energy, of which roughly 41% (16.2 mmBTU) would come off as gas during carbonization. If half of that was converted to electricity, each acre's worth would yield 2366 kWh; at 5¢/kWh, the electricity alone would be worth a whopping $118.33. The 3/4 ton of charcoal byproduct would be worth another $63.75 for the carbon-abatement payment, raising the total to $182/acre. And 750 pounds of carbon put through the improved algae process would yield 65.4 gallons of ethanol, worth $196.20 at $3/gallon. The yield of vegetable oil (for biodiesel) would be another 38.2 gallons, worth $114.44 at $3/gallon. The gross from the abatement credit and stover byproducts would be $483, worth more than the grain! If the charcoal could be sold as another product (for energy or chemical synthesis), the byproducts could easily be worth far more than the primary crop. What's the farmer's backstop price? 150 bushels at 56 lbs/bu is 8400 lbs of grain; if it is also 45% carbon by weight, the carbon-abatement payment for turning an acre's worth of grain into charcoal (~2520 lbs at 30% yield) is about $107, absent any production of electricity or liquid fuel. The electricity and fuel byproducts would be worth another $721. Below $4.80/bu the grain is worth more as charcoal and byproducts than as food. And that's just from growing corn, which produces 6.7 tons of total harvest (grain plus stover) per acre. A crop like Miscanthus, which produces 10 tons/acre with far less cultivation, would be much more profitable (if more subject to the market price of fuels and electricity). Last, there is the permanent improvement of the soil from the addition of charcoal. The example of terra preta shows that charcoal can create massive improvements in nutrient-holding ability, under the most adverse conditions, lasting at least two thousand years. Had the ancient Greeks and Romans used such practices, their soils would have been very different—and their modern descendants would still be enjoying the results today. This is literally an investment which can pay for a hundred generations. What farmer wouldn't jump at that? The problem is to take theory and reduce it to practice. The best system in the world is no good if you can't afford it. What would a system like this cost us, and what would it save? Let's start with savings. The USA is currently importing about 12.3 million barrels/day of petroleum and products; at even $60/barrel, that's $738 million a day or $269 billion per year. Eliminating 9.12 million barrels/day of gasoline and another 2.8 million barrels/day of diesel comes to 11.9 million barrels; this might come from ~11 million bbl/day of crude (after processing gain) and cost us $241 billion per year. The replacement of US transport oil consumption by domestic energy would eliminate demand greater than Saudi Arabia's production, lowering world oil prices and the cost of the remaining imports (which would be about 1/10 of current levels). Then there's natural gas. Eliminating 5.8 quads (roughly 5.65 trillion cubic feet) of natural gas demand would more than eliminate US net imports of natural gas. If we peg that at $8.00/million BTU, 5.8 quads is worth another $46 billion (another total bound to rise). That total comes to $287 billion a year. $287 billion a year is roughly $960 a head for everyone in the USA. There's got to be some sort of cost for this, so here's an estimate. The potential generation from carbonizer off-gas is 1620 billion kWh/year, or 185 GW average; the cost of solid-oxide fuel cells will be below the $250/kW point soon. If we assume that the balance of the biomass-processing system is $500/kW (including the power conditioning gear, carbonizer, fuel-gas processing, algae farm, fermenter and ethanol still) the cost of the system is $139 billion dollars. This is several times total US farm income, but it's less than half the annual savings from the elimination of imported oil and gas. It would be an immensely profitable move for the country. Even at $2000/kW, it would pay off in a little over a year. The savings would be offset a bit by additional costs of vehicles. Today's hybrids cost about $2000-$3000 more than their conventional equivalents. If we keep buying 17 million new light-duty vehicles per year, that would come to between $34 billion/year and $51 billion/year. This isn't remotely close to the savings. Then there's the effect of eliminating coal-fired electric generation and replacing about 600 million tons of atmospheric carbon emissions (2.2 billion tons CO2) with perhaps 500 million tons of carbon removals. The issues of earth subsidence, acid rain, mercury emissions, acid mine drainage and so forth would disappear. At $30/ton for a billion tons of coal and perhaps the same price per ton for a half-billion tons of charcoal, the savings would be about $15 billion a year. Last is the effect of eliminating carbon emissions. The eliminated motor fuel contains about 660 million tons of carbon, and the eliminated coal contains roughly another 600 million. We'd replace that with perhaps a half-billion tons of carbon removals. If we subscribe to the Stern report's social cost of CO2 emissions at $85/ton, the net savings would be another $155 billion/year. It looks like we could lay out $370 billion plus maybe $50 billion/year, and save ourselves $287 billion a year in imported oil and natural gas, another $15 billion a year in coal costs, and perhaps $155 billion a year in social costs from climate change and its knock-on effects. Unless I've missed something very important, it's not a question of whether we can afford to do this. It's a question of whether we can afford not to. The ever-present question for any scheme like this is if the public will accept it. This depends on a great many things, but a lot of it is how much change it would demand from people. The answer is "not much". And that's by design. Most of the various additions to the electrical grid would be completely transparent to the consumer. All the biomass-carbonization co-ops, algae-growth greenhouses and other elements would be off in the countryside, probably looking little different from other farm structures. Wind farms are far more conspicuous than this would be. The average driver would have to change habits slightly. Plugging in every night, or even at every stop, would be fairly important. But this would be offset by far fewer trips to filling stations. As fewer and fewer drivers needed liquid fuels except to go out of town, you might see fuel pumps disappear from convenience stores and even whole urban cores. They'd wind up clustered around freeway exits and at truck stops. The character of that fuel would change too. Use of the Ford/MIT direct-injection engine would require two fuel tanks instead of one, so the driver would have both a gasoline tank and an ethanol tank to fill. But the mix would shift over time; as petroleum was displaced by electricity and its ethanol byproduct, the driver would burn more ethanol and less gasoline. Finally, gasoline would only be used for cold-starting the PHEV's engine; normal operation would use ethanol only, with no added petroleum. And people would use about 1/5 as much liquid-fuel energy on average, perhaps 1/4 as many gallons if ethanol substituted for gasoline. At $3/gallon for ethanol but using 1/4 as much, people would pay about as much as they would if gasoline cost 75¢/gallon for current vehicles. Could we handle such things? Given that most people look at their windshield washer fluid every so often, I think that managing another fuel tank wouldn't be all that complicated. What of electricity, the non-fuel? The average PHEV car might consume 300 watt-hours per mile; Prius-like PHEV's would be more efficient at 200 to 250, and PHSUV's might come in at 400 or so. At 10¢/kWh, it would cost between 2¢/mile for the Prius+ to 4¢/mile for the PHSUV. Comparing against gasoline at 50 MPG for a Prius and 25 MPG for an economical SUV, the cost would be equivalent to gasoline at about $1.00/gallon. Off-peak electricity might cost considerably less. A driver covering 13,000 miles/year in a 25 MPG SUV would use 520 gallons of fuel and pay about $1300/year at current prices. Substituting 130 gallons of ethanol at $3/gallon ($390) plus 4160 kWh at 10¢/kWh ($416) would come to $806, a savings of $494/year. Even if we paid $3000 more for our PHEV vehicles, we'd get most or all of that money back before the car loan was paid. 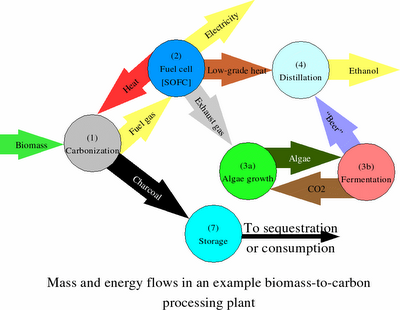 The algal carbon-capture step. Greenfuel claims 30%-40% capture efficiency, allowing at least 60% of the input carbon to blow through to the atmosphere. I assumed 60% capture, because algae can certainly grow very well on gas with 4% CO2 or more. But that's not the end. Natural systems extract carbon out of the air at a measly 380 ppm concentration. If the system can retain combustion gases in the algae-growth unit until the CO2 content is less than 1%, capture could exceed 90%; if the exit CO2 concentration is reduced to 0.1% (1000 ppm), the capture efficiency goes up to 99%. Photosynthesis by the algae replaces CO2 with oxygen; if the oxygen content is high enough, the refreshed air could be recycled through the fuel cells rather than exhausting it (and its residual CO2) to the atmosphere. Gas recycling would limit CO2 losses to the leakage from the system. Retention of gas for extended carbon capture appears feasible9. Energy storage. If carbon can be recycled very efficiently in the algae farm system, it could bank liquid fuel (or dried algae prepared for carbonization) and function as a solar-electric plant with long-term energy storage. Supply security. Stockpiles of charcoal would be a hedge against poor productivity later. Adding charcoal to the carbonizer and some oxygen and water to the carbonization gas would allow the carbonizer to run as a gasifier. With the substitution of carbon input, the electric generation and ethanol/biodiesel production systems could run at full capacity with less than the full feed of biomass. This guards against short-term supply crises due to droughts or grass fires. Heat reuse. The outlet heat from the fuel cell would be in the neighborhood of 800°C. This could easily run a gas turbine of 25% efficiency, raising the electric efficiency to ~62%. The exhaust would still be hot enough to make high-pressure steam. Integrated architecture. Algae farms might be light enough to be integrated into large, flat rooftops. If factory and commercial buildings could support the carbon recycling systems on-site, the waste heat and other byproducts of the carbonizer and fuel cell could be used for industrial process heat or space heat. This could make factories and malls "green" in a very literal way. 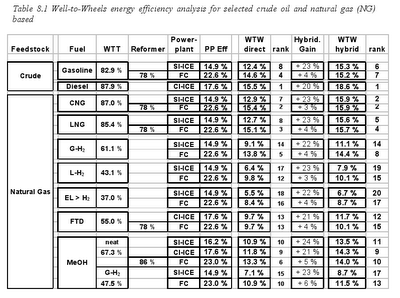 This analysis is limited to the replacement of fuels for ground transportation and electric generation. I include no energy to replace heating fuel, industrial energy consumption or several other types of essentials; some of this demand might be handled with better architecture and cogeneration, but the details are beyond the scope of this analysis. Neither do I consider the wisdom of relying entirely on biomass-derived energy and liquids to replace liquid motor fuel and fossil fuel for electric generation. Reliance on a single source risks all end-uses if the supply is interrupted. This would probably be very unwise indeed, and it appears foolhardy not to add large amounts of e.g. wind generation in the mix. The combination of battery-electric vehicles, wind farms and easily-throttled fuel cells would certainly have a total effect greater than the sum of the parts. Finance the fastest practical development and pilot test programs for solid-oxide fuel cells, molten-carbonate fuel cells and especially direct-carbon fuel cells. Processing systems for biomass carbonizer off-gas to feed SOFC's should be a priority. Block the issuance of permits for any coal-burning powerplants without plans for full carbon sequestration. Require most new vehicles to be PHEV's. Promote or require plug-in facilities for new or renovated construction. Some sort of net metering or other feed-in law is required for the grid. Get rid of all preferences and mandates for alternative fuels; incentives should be created by taxes on oil, coal and natural gas. The rest of the program has more to do with economic policy and foreign policy than energy as such. These are contentious elements, and I'll reserve my opinions on them for another day. Our current fossil-based energy system is problematic; perhaps fortunately for us, it is very inefficient and leaves a great deal of low-hanging fruit. Its inefficiency allows the complete replacement of the fuel used for transportation and electric generation by various direct and indirect biomass products. The cost savings could amount to the better part of a thousand dollars per person per year, and the environmental savings would be immense. Best of all, the public wouldn't have to endure any wrenching changes to make it happen. I would like to thank Sandy Cormack for introducing me to the work of John Cooper, Professor Goose for the encouragement to write more for TOD, and the un-named reader who told me that this blogging would soon produce enough material for a book. This voluminous piece feels like it was one. Bleg: The author has an odd combination of energy tunnel-vision, an analytical nature and the ability to think outside the box. He feels his talents are not fully utilized in his current line of work. If you know of any opportunities which match, please drop him an e-mail at the address listed in the sidebar. Wow! Very much worth the wait.. A lot to digest. Visionary. I like how it is bracketed by biomass at one end and electricity at the other - a carbon-neutral, bio-electrical-chemical (photo) synthesis. As far as opportunities go, you might want to hook up with Vinod Kholsa through Robert Rapier. As you probably know, Rapier passed on an opportunity at Kergy, but this might be setting your sights low. Should generate a ton of discussion! About charcoal. I was aware of the Eprida folks, Terra Preta and bio-char. I had seen the work in Hawaii in passing. I didn't realize the level of advancement there. Exciting stuff. Thanks! From what I can see, Vinod Khosla dictates; he does not listen. If he doesn't have a similar idea going, he probably wouldn't give it a hearing; if he does, he doesn't need me. That's a lot of information to digest but it sounds like a step in the right direction. We need to take a good look at this type of integrated processes without losing sight of efficiency. But I was wondering if this might not result in switching from one finite fossil resource to another. Much of that biomass would be grown in the Great Plains (AKA Great American Desert) using a non-renewable aquifer. It's already overused and adding in the marginal land would only make it worse. I fear that there is no way to prevent a good idea from being executed badly. On the other hand, the expense of pumping water versus the profit from native rain-fed grass crops could fix the problem with pure economics. I have written a long response to your proposal over at my own blog, hopefully we can have a fruitful dialog and improve your idea. I think my largest criticism is the size of the greenhouses required for the algae solution, so perhaps you can work on refining that part of the system. Even assuming a rather low level of productivity (IIRC, Greenfuel says 150,000 gallons/acre/year... of oil) the amount of land required for the algae growth isn't very large. If you assume a plant in corn country, drawing its feedstock from a square 40 miles on a side consisting of 80% fields producing 2.5 dry tons/ac of stover, you'll get 2.05 million tons/year of stover. 15% of that (carbon in off-gas) is 307,000 tons; capturing 60% as ethanol is 184,000 tons of carbon in 353,000 tons of ethanol. That's 107 million gallons a year. At 10K gallons/acre/year you'd need 10,700 acres of algae ponds out of the 1.02 million acres which feed the system: roughly 1%. That's a great synthesis of ideas. If you go back through a year or two of posts you can see it forming up steadily. I especially like the option of burrying the some of the charcoal to get some durable sequestration. The best part about it is the minimal changes to people's habits and not so much need for a massive infrastructure investment (like electrified rail transport). This obviously greatly increases chances for adoption. The only nitpick is that you can't count $85/ton of CO2 as a savings if we're also going to use that as a subsidy to farmers and corps to make the process more economic. Maybe a better place to send ideas like than Khosla this are companies like BP, Shell, or Exxon-Mobil with tons of capital, that are also probably looking to diversify as a hedge against a future where fossil fuels are less important. Or ADM also, of course. If their lobbyists get behind something like this, who knows what could happen LOL. This post just sent the idea to the whole world. Unless someone else has already filed a patent, they're S.O.L.! - Industrial-scale carbonization systems (tens to hundreds of tons per day). - Both solid-oxide and direct-carbon fuel cells. - Selection of algae cultivars for biofuel production. - Processing systems for algal fuel. - Charcoal processing, storage, shipping and feeding systems. The list goes on and on. There are so many distinct pieces that I can't see one company, or even one industry, having even half of it. 1. You mention that the output temp from the fuel cells is about 800 c.. is this from the SOFCs, the DCFCs, or both? I ask this b/c you note that the "waste" heat from the cells could be used to run a gas turbine, and also to generate high temp steam... could this be done at both the SOFC and DCFC steps? If it is impractical to move around heat (to areas like individual residences) obviously this energy could be converted to electricity to run some heat pumps or provide electrical resistance heat... mitigating some of the fossil fuel use for home heating. I guess that the SOFC/pyrolysis heat could also be used to help dry the biomass, in addition to driveing the reaction or producing more electricity. 2. If, as you suggest might be feasible, we also try to capture some of the C02 output from the DCFC steps, then this could produce biodiesel that could be used to mitigate some fuel oil usage for heating. Though, from a carbon standpoint, I guess this would basically be equivalent to sequestering the CO2 (as you also suggest) and using, say, natural gas as a heat source for homes. I guess whichever process is more economic would win out in that case. John Cooper (follow the link, that's why it's there!) says the DCFC systems operate at 700-750°C. The figures I've been seeing for SOFC's are in the 800-850°C range. That's more than hot enough to drive a microturbine and/or steam cycle. I agree that SOFC off-heat would do well for final drying or even preliminary roasting of biomass. I suppose it depends what sort of processing yields the greatest amounts of the desired products; I read some things which suggest that greater water content leads to more char. So long as enough heat is left over to distill the alcohol fractions, the disposition of the rest is open. One thing which occurred to me too late to mention is that the SOFC off-heat is probably sufficient to run a thermochemical conversion process to turn algal vegetable oils into light hydrocarbon oils instead of e.g. fatty acid ethyl esters (biodiesel). The process also yields char (fuel or for sequestration) and gas (right back to the SOFC feed stream). The water would go back to the algae pools. Once you start seeing cycles in this sort of thing, it's hard to stop. I'm not sure if anything that came out of this could be called a waste product. Actually, the Green Fuels site says 5,000 to 10,000 gallons of biodiesel per acre per year, and a similar amount of ethanol. I have already done the calculations at my blog entry - it works out to 5.5 million acres, which is something like 1% of the entire area under cultivation in the US today, or about 5% of the area that you claim will produce the biomass. Given the cost of these bioreactors (it's a lot more than just a greenhouse), I think 5.5M acres of them is likely to be the single most expensive part of your plan. It was something at GCC that mentioned 150K gallons/ac/year, then. Greenhouse costs are hard to find on the web. I found a 35'x96' cold frame for about $3800. This comes out to about $1.13/ft^2, $49000/ac, about $220 billion for 4.5 million acres. This would still pay off in a year or so. More likely, we'd just use massive tubes of heat-welded poly sheeting on carefully graded surfaces at maybe 10¢/ft^2. They'd be inflated by the exhaust of the fuel-cell gas feed systems. It would take years to ramp this system up. We could get a lot of experience with cost-engineering along the way. As for the land, what's farmland worth? $1000/ac? $10,000? $55 billion at the latter figure hardly changes the conclusion; at the former, it's chicken feed - and the productivity per acre is sky-high. The striking bit is that the $85 in carbon subsidy is only a fraction of the revenue for the farmer. The rest of it is dependent on the distributed mini-plants for charcoal and all of the ancillary products. You've done the macro-calculation, but a key question is the capital cost of each plant. This determines what sort of financing structure would pay for the plants. Another key question is what's the minimum fraction of the system that would pay for itself for a farmer? Is there some smaller piece that would still pay for itself and allow add-ons that would use more byproducts to generate more revenue? I agree with the first poster -- Khosla (or other big-league vc) could be part of the solution here, depending on the micro-economics. I wouldn't count out Khosla or other VCs. They are ego-driven and greedy, but if they see something that makes them money, they'll bite. * a sales pitch that tells the story in 5-15 minutes. Don't look now, but I also suspect this enables the political problem to be defined locally at first. There are already states -- including Texas -- where there is a strong rural lobby in favor of wind energy. Anywhere that is the case can also build rural support for the legal infrastructure to support generation from biomass. So, you don't need to do the top down carbon refund (yet! ), you just need enough rural folk to drive their state legislature to remove barriers to distributed generation. There is one other thing that you may have overlooked. You state that you expect that farmers could earn as much as 5c kWh for electrical genereration, but this is unlikely as much of the cost of power generation is repayment of capital costs. I appreciate that you've listed all farm outputs as gross earnings, but in most cases the capital costs are either already paid for (previous infrastructure) or are negligible. With power generation this would not be the case. Plus it would be more than likely that a co-op of farmers would contract the operation of power generation to a small/medium utility with a biomass purchasing contract. Would it be possible to reform the pyrolysis gas into a H2 rich product and then run that through a fuel cell to create electricity? Aren't those 80-90% efficient (of course, I don't think that they are as ready for prime time as the SOFCs, and especially not from a capital investment standpoint... and you'd probably have to seperate out the other molecules which would also require energy)? "Further, by adjusting the amount of oxygen injected along with the soy oil or sugar water, the method can be adapted to make synthesis gas"
"The speed makes it possible to produce more fuel from a smaller reactor, reducing capital costs and potentially making it practical for a farmer to use a small system on the farm." EP is correct in attacking the energy inefficiency of our present liquid fuels systems. But politics will get in the way of any solutions. The large international energy companies (RR and I work for the same one) should be a major part of this scheme. They have the intellectual and fiscal capital to make this work. Sadly, many alternative energy advocates are interested more in punishing traditional energy companies than coming up with real solutions. The main arguments for supporting Prop 87 are proof of this. We can't afford this kind of thinking if we wish to make progress on these issues. The large international energy companies (RR and I work for the same one) should be a major part of this scheme. They certainly can play a part in theory but without a motivator like a stiff emissions tax I don't see them allocating the resources into anything but doing more of the same. For example, how many millions are being spent right now by Shell in planning shale extraction? BBM: I think the complication of a separate hydrogen-production step (which also loses energy) would be a bad idea. The efficiencies I've seen for PEM fuel cells are in the 60% range; SOFC's can probably hit 60%, but without the fuel preparation overhead. On top of that, you lose the high-temperature operation which can drive the pyrolysis process and perhaps a thermochemical conversion process (turning fats into light hydrocarbons) also. Go back to the mass-energy flow diagram and see if you could make it work without bubble #2. I'm skeptical. Dovish: I can think of several reasons for an oil company to get into this now. Any oil company without large reserves (and that seems to be all the non-state ones) is going to face rising prices for feedstocks. Imagine being able to undercut the state suppliers and break into a very different market (electricity) while getting huge amounts of green cred. With a foot solidly in that business, measures against global warming would be to YOUR competitive advantage! The difficulty I can see is that oil company execs (and their pet pols) know only one business very well and are not sure how to go beyond it. If they ever think about diversification, they probably think of Enron. This does indeed look like a problem. Well, you could still use the heat from the pyrolysis gas to dry the biomass and drive pyrolysis, and then extract any heat remaining through a combined gas turbine/steam generation prior to the seperation process (if that step were in fact needed prior to runing the H2 through a PEM. But you're probably right in that the advantages of SOFCs would outweigh any benefit to the PEMs, especially if you do need to seperate out H2, and especially if PEM efficiency only comes out to 60% or so (I thought they might be higher). EP - again you have hit the nail on the head. The international energy companies have capital and knowledge but only limited access to conventional oil & gas reserves. The balance of power in negotiations has swung from the oil companies to the national oil companies (NOCs)and their state sponsors. (Think PEMEX, PDVSA, Gazprom, etc.) The NOCs dictate the terms for participation in their country's oil and gas sector The percentage of government take can run to 90% or more through royalties, taxes, and forced participation of the NOC. Here is the problem though - a carbon tax alone won't work. If the US switched from fossil fuels to bio-fuels, the price of conventional oil and gas would fall like a rock. Remember that in 1999 the price of oil was around $10-12/barrel. Soon the biofuels would no longer be competive. Consumers and energy intensive industries would claim that the rest of the world enjoyed an advantage. To make it work, the US would need to shift from gas taxes at the pump to taxes on imported conventional fuels. Likely, the industry would need some income tax relief or incentives to make the switch. Switching the entire US liquid fuels system to bio fuels absolutely would require some Gov't protection and a rethinking of our tax and foreign policy systems. Why wouldn't a carbon tax work? The Stern report's $85/ton number would raise the price of bituminous coal (roughly 60% carbon) by about $50/ton (up from maybe $30), a barrel of oil by about $15. This wouldn't affect the price of oil very much, but it would set a floor below which biofuel prices could not go until supplies had completely pushed fossil out of the marketplace. I hadn't even thought about national carbon initiatives, because no nation is going to accept the handicap of going it alone and letting foreign interests undercut its industry. Even the EU is too small. If there's going to be a workable carbon tax, it's going to be on the scale of the Kyoto treaty (the rest of the Western world, sans Australia, is ready for this). This will effectively set a floor under the price of many fuels (and their products) across the world, and make biofuels and bio-feedstocks that much more attractive because the markets would be that much bigger. Tax revenue is the last item, and I think it's less of an issue than you think. Just retaining $287 billion in the national economy would increase revenues by about $60 billion; a carbon-neutral nation would be a wash for carbon taxes. Last, it's hard to put a price tag on items like coastal real estate, coral reefs and forests, but just thinking about them makes me certain that Stern is correct. I like your ideas and think they may be workable technically, but not geopolitically. If the carbon tax sets the floor, then you can count on the worldwide crude price to match it. The Kingdome of Saudi Arabia produces its 8 million barrels of oil with only some 1,600 wells and lift and transportation costs of maybe $3-4/barrel. Threatened with the loss of their petrodollars - they will flood the market with cheap crude. To maximize the incentives, why not eliminate the income tax on any biofuel production in favor of a carbon tax alone? So let the worldwide price of crude match it. That transfers wealth away from the NOC's again, as does any depression in price from conservation or replacement. As the price falls they'll have less money to spend on keeping their production up, and their collapse (and replacement by renewables) accelerates. Word is that KSA and Kuwait are both past-peak and maxed out; they couldn't flood the world market if they wanted to. The one wildcard is Russia, but without foreign investment it's doubtful they'll boost production much either. Renewables seem like a safe commercial bet this time around, and carbon taxes would guarantee it. The best thing about it is playing along with the political issue of farmer subsidy instead of fighting it. That's... poetic. It makes it possible to believe something like this might actually happen in the real world. I'm not sure if anything that came out of this could be called a waste product. The political angle had to be part of it from the beginning. I want things to happen, and if it takes buy-in from the farmers with dollar signs in their eyes to beat the pull of the coal and oil interests, so be it. You can't push anything like this if it means a lousy lifestyle either, so the average American has to buy in. Creating a way to make it attractive to people who hate the oil companies, people who want to get back at OPEC, and the green-minded was the hard part. The energy companies MUST be part of the solution for your ideas to work. The compelling argument for their management and shareholders is access to reserves and the ability to make money on technology development of biofuels. "GET OVER IT!" You are standing in the way of progress. This is good work, but it is still weak on the front of sustainable agriculture. We really don't have a good accounting of what nutrients go where. We don't know if you actually can seperate the valuable ash from the crap, and if it can be properly absorbed by the plants later. The Nature article you link on Terra Preta specifically notes that charcoal is a very fine material and needs to be tilled under or it can blow away in the wind. If you are continiously adding large volumes of fine material to the soil it will very likely change its properties. Will this make soil more prone to erosion from water runoff, etc? For these reasons, and because I am generally a conservative scientist, I am still inclined to move away from massive scale biofuels. We can clearly offset some of our petroleum consumption but I think that number is more like 2-5 %. Energy efficiency is a much bigger impactor overall, but it does require that people change their habits. but I think that forcing change in every citizen, while difficult, will be better in the long run. We need to encourage people to be more open to change rather than reactionary. KingofKaty: I'm sure that energy companies will be a huge part of what comes. However, electric utilities are positioned at least as well as oil companies to take this position. If you look at the growth path, renewable-energy outfits could wind up holding all the chips. One thing is absolutely certain: in the relatively near future, people are going to be consuming a lot less petroleum. If oil company power and profits depend on volume, they are going to be much smaller and less influential someday. Robert: The tallgrass prairies were created by periodic burning. While we may have to do more than just return ash to make grass crops work sustainably, I am certain that the difficulties involved are far smaller than with any sort of row crop. Oh, and I'd like to add, this is a superb piece of work, which with any luck 50 years from now will be recognised as "genesis" for a sustainable energy system. Many of the diehard doomers on TOD seem to be quite upset, but as a fellow engineer, I can see that creating soloutions is a much better way forward than doing nothing. There are niche markets for industrial consulting firms engineering co-ordinated plant strategies to minimize waste energy and maximize recycling/energy conversion. Since energy sufficiency is necessary to continued prosperity, I expect a huge demo project for proof-of-concept should find a government sponsor somewhere ( China ? ). Aren't they? Tis' a dream devoutly to be wished! I wouldn't have as much of a problem with them if they backed up their pushback with numbers. If this piece is recognized as anything 50 years from now, it will be a success beyond my wildest dreams. The only thing which amazes me more than the warm, almost desperate-for-hope reception here and at The Oil Drum, is the fact that nobody else came up with it first. There are tons of PhD's out there whose whole raison d'etre is research, but for some reason this guy with no lab, no staff and just a BSEE scooped 'em. I guess this is an argument for being a generalist and not a specialist. "Many of the diehard doomers on TOD seem to be quite upset"
Yes, it was a thumb in their eye even bigger than "What side are they on?". You have no idea what I'm planning as my next taunt! "I can see that creating soloutions is a much better way forward than doing nothing." As Robert Rapier said a little while ago, solutions are what engineers do. "I wouldn't have as much of a problem with them if they backed up their pushback with numbers." Like many cults, most of the rank-and-file membership are innumerate. nobody else came up with it first. Others like RMI have hatched plans to get the country off imported oil. However, if "it" means weaving together biomass, pyrolysis, fuel cells, biodiesel from algae, carbon sequestration and an incentive plan to knock out the U.S. contribution to climate change, fuel the economy AND get us off imported oil and gas - yeah you probably did get there first with a plan and some numbers. I like how the 100 million acres puts an upper bound on the problem. People will then be challenged to change up the efficiency, renewable or carbon-free mix so we don't put so much land to the plow. Call it "E-P's boundary" or something similar. Converting electricity to motion in an electric motor is much more efficient than burning fuel in an engine, or even fuel cells, which is why we should use plug in hybrids powered by electricity as much as possible. Last year I generated 4565 kWh with 23 square meters of pv panels (in Silicon Valley, CA). This is about 200 kWh/yr per square meter. So you could generate 4 trillion kWh/year (the total US electricity generation) with just 5 million acres of my panels. I have Kyocera KC167G panels. The latest Sunpower panels generate 35% more electricity per square meter, so you'd need even less area with those. Less than 0.2% of the US land area would be required for 4 T kWh/yr. I realize there are issues with solar, e.g. energy storage, but we could ramp up solar for years before we had more capacity than the daytime demand. Every day the sun dumps around 9,000 times as much energy on the earth as we use, so there's plenty of margin. Of course the energy in biofuels also comes from the sun, but each acre of plants captures a much smaller amount of the available energy compared to pv. Plus there are issues of water and soil depletion that have not been addressed, AFAIK. Biofuels are appropriate for uses where a liquid fuel is the only way, but we should use solar pv to the extent possible, i.e. electrical applications, including a good chunk of transportation. Only 5 million acres, eh? What is the price per acre of Kyocera KC167G's? Not to be snide, but any realistic program has to be something we can afford to implement, and soon enough to make a difference. The price is around $3M - $4M per acre. Yes, that is a lot, but if we spend an equivalent to what we're spending in Iraq every year it would add up after a decade. After 30 years the output will drop 15% - 20%, but they'll still be working. This assumes no economy of scale, and absolutely no new technology beyond what is commercially available today. Wind is cheaper, so that ought to be pursued, and it is. What is the 30 year cost of your proposal? It's a lot more complicated since there's a lot more to it, but I'd like to see a rough estimate. My biggest concern with mass solar rollout programmes is lifetime issues. What kind of life expectancy does the average panel have after weathering, UV radiation degradation, accidental storm damage (especially after 20years in-situ) etc etc. Truth is we just don't know (at least for the latest and greatest cells anyway.) We may have a feel for the earlier first gen sets. Oh, and EP, you've just put your finger on what most irks me about doomers/greenies/environmentalists. Not many people do Ph.D.s on policy. That said, if you're bored with work, a time in grad school to actually experiment with the particulars of your proposal would lend it vastly greater weight. What kind of life expectancy does the average (PV) panel have after weathering, UV radiation degradation, accidental storm damage (especially after 20years in-situ) etc etc. They are guareented by the manufacturer typically to operate at 90 % of rated capacity after 12.5 years and 80 % after 25 years. The degredation is mostly due to cosmic rays, not hail or other factors. The crown glass used in PV is very tough stuff. 5 million acres at $3 million/acre is $15 trillion for the production hardware alone. Storage is extra. If we invested $200 billion/year, it would take 75 years to get there. My proposal came in at an estimated $360-odd billion for the hardware, plus as much as $50 billion/year for vehicles (which would be repaid rather quickly). Over 20 years, that's roughly $1.4 trillion plus O&M; at $200 billion/year we could have the whole setup installed in 2.5 years and then pay only $50 billion/year. My proposal includes ample storage (stockpiled charcoal plus biofuels in tanks plus batteries in vehicles for V2G), and it can be used in a way which actively extracts carbon from the atmosphere. There are reasons to have some solar PV (emergency backup power, for one), but if the goal is to gain energy security and mitigate climate change, the major short-term investments should be elsewhere. When PV hits $1/peak watt it will be time to use a lot more of it. Who would be crazy enough to take me on as a graduate student, so many years out of engineering school? Anyone you know? And that's assuming that there are any significant questions regarding feasibility that my own work could settle; for instance, Greenfuel just announced production of commercial-quality biofuels from CO2 scavenged from an Arizona powerplant. The evidence piles up almost faster than I can keep track of it. These are processes where you can have your Bio-fuels, Major Carbon sequestration, and fertility too. I thought, I first read about these soils in " Botany of Desire " or "Guns,Germs,&Steel" but I could not find reference to them. I finely found the reference in "1491", but I did not realize their potential . Also, Terra Preta was on the Agenda at this years world Soil Science Conference ! If pre Columbian Indians could produce these soils up to 6 feet deep over 20% of the Amazon basin it seems that our energy and agricultural industries could also product them at scale. I'm sorry EP, I only wore a pocket protector for a short time in my life, so I am having trouble following the rationale. How does a scheme to capture a billion tons of carbon a year — 30% of it is turned into gas — resulting in 1.1 billion tons of carbon dioxide, reduce green house gas emissions? 1.72 billion tons of biomass grown, containing ~770 million tons of carbon. Roughly 516 million tons yielded as charcoal. This charcoal can either be used as a soil amendment (full sequestration in soil) or used at remote sites for electric generation (which allows sequestration as liquid CO2). That's up to half a billion tons or so taken from the atmosphere and not replaced. Roughly 258 million tons liberated as gas (CO, CO2, CH4) during carbonization. This is either vented as excess from the algae growth system (liberated immediately) or turned into liquid fuels (probably vented later). The billion tons or so of avoided emissions comes from the coal and oil replaced by the energy generated by this system. Clearer now? he said he spoke with a major National Geographic editor, who is preparing a big article on TP. but Doesn't know when it will be out. RE: Nature Article — the link given on the previous page,will not allow access without being a subscriber to Nature. I posted it Before Nature started requiring a subscribing membership, here is a link to the original pdf version. The pdf version is still accessible without a membership. That's behind a paywall now too. WOWA, EP quite the thesis! I know you showed that EtOH does not make a lot of sense (you need how much energy for distillation), but what about biomass gasification/Fischer-Tropsch as proposed by the German company Choren? As for energy crops: I believe algae are way ahead of anything else. Unfortunately a land-based system does not appear feasible: I think it has to be open, considering the size and would have to be located in a low population area (a desert). Combine that with evaporation rates and limited water availability and it is a no-go. Only solution: do it at sea. I dealt with that; the efficiency of the internal combustion engine is far too low for a biomass-to-liquids play to even replace gasoline. If you can achieve 100 gallons of ethanol per ton, 1.7 billion tons of biomass would give you 170 billion gallons of ethanol. You need about 210 billion gallons to replace US gasoline consumption alone; it would take much, much more to replace diesel and coal too. The difference is that you can get net efficiencies over 50% if you skip the conversion to liquids and combustion engine, compared to 7% or so for the bio-liquids path. Seven times the efficiency lets you accomplish seven times as much. It's that missing factor of seven which keeps us from replacing petroleum right now. If we stick with the internal combustion engine and the conversions required to feed it, we'll be blocked forever. We seem to agree on the need for energy independence. We need to promote this view in terms of foreign policy improvements as well as environmental benefits. But I noticed one detail: you have the farmers getting a retail price for their liquid fuels, and consumers at the pump paying that same price. Unfortunately, a huge amount of profit and taxes get siphoned off in order to drive that fuel from the producer to the consumer. You might want to look up wholesale prices of gasoline and diesel, and use these in your analysis of the producer's economics.